* Lime In The Coconut: "When it is dark you can see the stars... open your heart. "When it is dark you can see the stars... open your heart. I was privileged honored, and oh so moved to meet last night. A true king among men. and remote mountain regions of Pakistan and Afghanistan. where the illiteracy rate of females is 58%. and you educate a community. " He is a gentle man with strength and hope abundant. lies in the education of all the world’s children...Especially the girls. boys to choose death over life. But he is welcomed into each community. The tribe invests in each school...each student. poor and malnourished, but all eager to learn and get educated. They do it for their future. really can change the world. Have an extra penny....send it here. Pennies have built schools for girls. Many. Want to be inspired to move? Three Cups of Tea,One Man’s Mission to Promote Peace—One School at a Time. After talking to you this morning about this and knowing the story, I was still moved to tears. 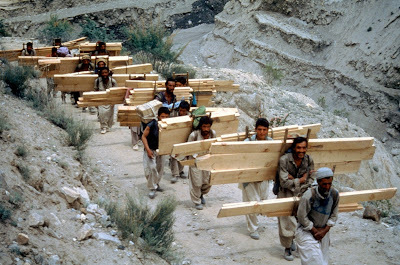 Especially after the photo of the townspeople hauling the lumber. Even in one of our worst economic times, we are still such a privileged country. How lucky we are. And what proof that one person CAN really make a difference in this world. Thank you for this beautiful post. i'm posting several of the pics on my fridge, i will donate and i will keep these little ones in my heart, especially the girls! thanks for the heart ck..
Oh Linda, this is SO powerful! Thank you for this post! We need to get the word out about the people that are making a difference in our world. It will inspire others to look to see how they might make a difference. Sometimes it is the little things that make the biggest difference.. In January he was nominated for the Nobel Peace prize...in a bipartisan move from congress. I read this book last spring, and everyone should read it. 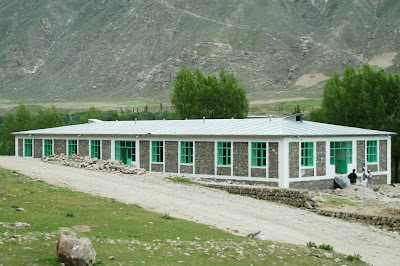 The sacrifices he made in his own personal life to raise money to build these schools is stunning, and his devotion to the villagers is a true testament to his spirit. I had the priveledge to work in Afghanistan from 2003-05 and I can tell you that the people and cultures of this area of the world are soooo different from ours. For him to be welcomed into these communities the way he was--especially to build schools that (gasp!) welcomed girls--is stunning and speaks volumes about how amazing and wonderful he is. Lucky, lucky you for having a chance to meet him, and thanks for sharing it on your blog. I've seen that book and planned to read it. Thanks for the thought-provoking post. Oh Linda, thank you for posting this, and for being one to not only spread goodness, hope, and to be a light, but to provide an opportunity for others to participate in it. Beautiful, I gave that book "Three Cups of Tea".. to my Sis last year for Christmas..think I'll borrow it back from her and check it out! Linda- thank you for this post. I was in need of some perspective and this hit the spot. We truly are so very blessed. What a wonderful man, and what a wonderful mission. j. Yes, a truly wonderful post Linda! 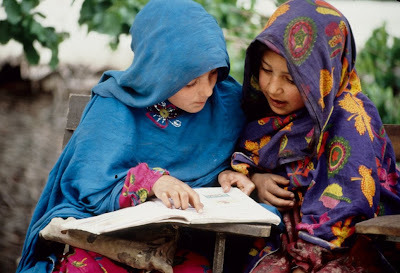 Despite the joyous news that over one million girls are now receiving an education in Afghanistan, hostility to girls' education continues. Taleban sympathisers against the education of girls still attack schools in in an attempt to stop parents sending their daughters to study. More good news is that several hundred women have recently been able to take the entrance exam at Kabul University. Many of them want to become educators, as there is still a huge shortage of teachers. All power to them! Can't think of anyone more worthy of a Nobel Prize than Greg. Wow. I'm a whole different kind of inspired tonight. I read the book and loved it so much. Thanks for honoring his mission with your post! Millie...you are so right. schools are bombed, teachers are killed or told to close down the school.The goal... to terrorise families into keeping children uneducated, unemployable, and a recruitment pool for the Islamists. Mortenson told of beautiful brick and mortar schools built by the Swedes...or us,or another benevolent nation perhaps... that stand empty because of the beurocracy and permits and tribal agreement needed. Meanwhile, children...girls...have walked for hours and are huddled under a tree within eyesight of the school, scratching out math on the crusty ground.Doing their work. They are passionate about this chance for education. Have endured much, and are willing to sometimes sacrifice their lives for it. It is haunting and beautiful and painful to me. His MO is to build the schools the tribal way...follow tribal law and custom respectfully...then engage THEM in the building of THEIR school. Not doing it for them. So far it has worked...only ONE of the hundreds that he has helped these remote, tribal communities build has been bombed. Thank you for all of your beautiful heartfelt comments...It makes a difference. And as always...there is so much more to do. I am sending my penny, and am so blessed that I found your blog. My daughter and I sing "Lime in the coconut", sometimes...and this is what brought me to your beautiful blog! This has made an impact,already, on my day! I was going to post the most inane thing today...so glad I got a reality check. I was so awed when I read his book. He is an amazing man. What stirs me most is HIS dedication to educating GIRLS. If the world had more men like him...I mean really, bumping up ridiculously rocky roads, hiding in a rickety pick-up truck with fresh animal hides on top of him, just so he could meet with a tribal leader who he had an outside chance of persuading him to allow girls to learn...that's DEDICATION! Amazing and powerful post, Linda. Three Cups of Tea is the most inspiring story I have ever encountered. As a teacher, I am moved by the works of this man. I wish we could pass a law that mandates every American to read his story. I know that I am forever changed, as a teacher, as an American, and as a human being. I love that book. Great post. I really love your blog! I am so glad to of found it! I love him...for our anniversary Greg gave me 3 copies so I could pass them around. Everyone needs to read and understand these efforts. ALSO..I found this post by poking around trying to find the post you had about the beautiful resort in FL, looked like a tropical island, bright colored victorian buildings...great food??? You post of so many lovely places I wonder if you remember this one? ?